We are just moving into the best season to curl up and cosy up with a good book! And we have read lots of really great books recently. 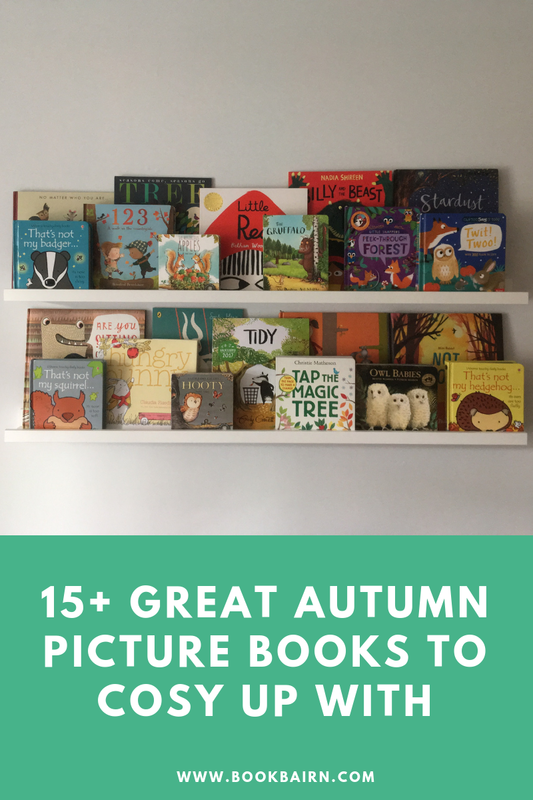 I have shared our favourite Autumn stories (linked here) if you're looking for a seasonal book, so in this post I'm just sharing our 'Favourites Shelf' books. The books that we have read over and over again in the last couple of months. And as The Wee Page Turner continues to develop his own reading taste (I think he might enjoy books more than his sister as he chooses books over toys so many times a day! ), I've included some of the books that he grabs out of the book basket most often alongside BookBairn's favourite books at the moment. One of the first signs for us that the seasons are changing is when we go and pick apples off the apple trees in our garden, so reading The Mysterious Apples by Diana C. Vickery & Danny Deeptown is the perfect way to start our autumn reading. It's the story of two squirrels, Yasmin and Yo-yo who collect as many apples as they can carry. But these greedy little squirrels have eyes bigger than their drey can hold and they have to find a bigger place to stash their apple hoard. Unfortunately for them they decide to put their apple hoard in a basket by the cottage door and Mum is surprised to find that someone has picked the apples for her and she makes an apple pie. Written in delightful rhyme, with wonderful illustrations packed with garden and woodland creatures, this is a lovely autumn read. We previously review it here. Also in the series is A Little Owl Called Hooty (by the same author and illustrator) and stars some of our favourite woodland creatures and two benevolent cats, Swankypants and Chatterbox. Hooty is a baby owl who has watched all his brothers and sisters leave the nest and despite his hunger he struggles to leave his branch. He is afraid of heights. Not much use for a hungry little owl. Swankypants and Chatterbox look on, trying to encourage Hooty to find the courage to overcome his fear. What a lovely story of friendship, love and conquering one's fears. The illustrations are beautiful and filled with detail allowing older readers to count the numerous butterflies fluttering across every page. The colour-palette is limited to autumnal tones making it a piece of artwork worthy of the magical story. Our original review, and a very little BookBairn, is linked here. If you have a child under the age of ten, you will have come across this series before. 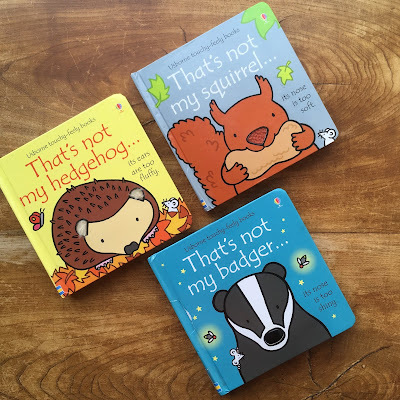 The That's Not My... books by Fiona Watt and Rachel Wells are some of the best baby books with textured elements that little fingers can explore. We love them and our library has a great collection so we picked up some autumnal creatures to enjoy over the next few weeks. You could buy endless numbers of these books, and they really are great, but worth checking out what your library has too so you can try before you buy. I particularly like the hedgehog as the very final page is delightfully prickly! As the seasons begin to change and children can see the leaves on the trees change colour and then start to fall, it's wonderful to pair what they can see in their world around them with magical and beautiful storytelling. Following the life cycle of a tree through all the seasons has never been so beautiful in a book as brought to life by the incredibly talented (and a favourite of ours) Britta Teckentrup. In Seasons Come, Seasons Go: Tree, the clever die-cuts on each page are wonderful to add depth to the illustrations, and now in a board book edition, it's perfect for little fingers to explore as you read the lyrical rhyming couplets. Part poem, part work of art, part non-fiction, this book is a beautiful journey for little ones learning about the changing seasons. And it might also make us grown ups stop and appreciate the wonder and beauty of nature around us. One of the fun things to do in autumn is woodland walks and conker gathering, and we are very lucky to live in a country town with several buggy friendly woodlands withing walking distance from our house. BookBairn has loved seeing the leaves change colour and fall off the trees. BookBairn adores the character in Tidy by Emily Gravett and finds the main character Pete's preoccupation with falling leaves fascinating. When all the leaves falls off the trees in Pete's forest, he cannot resist the urge to tidy them all away. And then the trees look rather scrappy without their leaves on them. So they get tidied too. Until the forest becomes a concrete abyss. Badger has taken it a little bit too far. But is it too late? With humour and delightful illustrations, this is a lovely autumn read. BookBairn just loves this story so much! Accompanied by beautiful illustrations that BookBairn loves to pore over, spotting all her favourite creatures, this magical book really teaches little ones about acceptance, generosity and to empathise with others. Our full review of this one can be found here. Sunny days in autumn make for perfect walks. BookBairn, The Wee Page Turner and I explored a lovely walk near us and enjoyed looking at all the wonderful things around us: ducks, pine cones, geese, leaves, robins, squirrels, mushrooms, blackberries and more besides. And we could have spent ages counting them. We basically brought 123: A Walk in the Countryside by Rosalind Beardshaw to life. This is simply a counting book 1-20 of autumn flora and fauna. 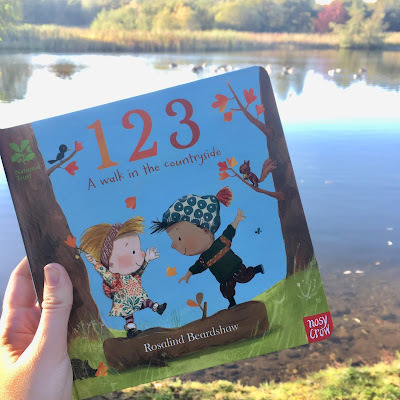 But it's exactly what you see out there on a autumn walk, making it perfect for text to life connections and bringing books to life. The illustrations are sweet, packed with details and capture the wonder of autumn time. This is a book that we haven't read recently but I couldn't not have it on the list because when BookBairn was about 18 months old we read it over and over every night. Peek-Through Forest by Jonathan Litton and Kasia Nowowiejska is a woodland search and find for very little kids with accompanying text that tells a little bedtime story, as well as a side-flap on each page that has facts about the animals. The woodland creatures are sometimes hiding under the numerous flaps and are beautifully illustrated. That's a lot to pack into one little book. It's a great one for the youngest readers shelf! 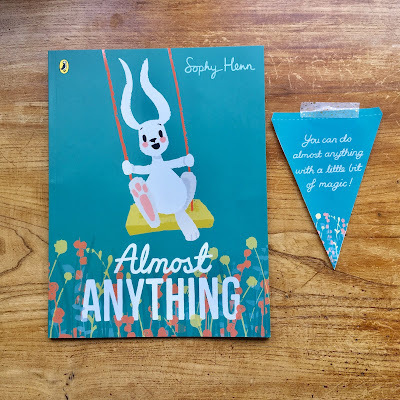 Another woodland based story, Almost Anything by Sophy Henn is a wonderful story about self-confidence and stars a whole cast of woodland creatures. George, the rabbit, thinks he can’t paint, bowl, dance or skate like his friends and he’s too afraid to try. Bear makes him a magic hat to give him the courage to try and when he does it turns out he can skate, and dance and read and a whole host of other things! But then George loses his hat, and his confidence with it. How will he be able to join in with his friends? If he can't do all the new things he has learned how will he have fun? So Bear tells him the truth: the magic didn’t come from the hat, it came from inside. Now doesn’t that sound like a magic picture book? When you feel like everyone else can do something but you can’t it can leave you feeling lonely and left out. And in this book little ones will see that all they need is a little bit of confidence to try, resillience if they fail, and friends to help them find their own magic to succeed. And if all else fails - a paper hat might do the trick! We reviewed this one and selected it as our best book of the first quarter of the year, you can read about it here. In autumn, BookBairn enjoys seeing the night sky and gazing up at the moon and the stars. 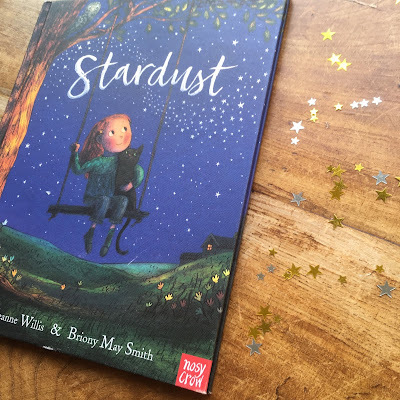 Stardust by Jeanne Willis and Briony May Smith is the most wonderful book for making your children feel special. The little girl in the story is constantly outshone by her big sister - she's the star, the centre of attention. Until her granddad shares the secret that we are all made of stardust. We are all special. The illustrations are magical and I love the use of a darker colour palette for all the nighttime scenes. BookBairn and I just love reading this one, and it's a nice little reminder to read at the moment to remind her she's a star. She even says "mummy we are all made of stardust" - what better message to share with your little ones than that? During autumn, we have started to enjoy some spookier stories, perhaps it's the influence of Halloween, and perhaps it's that BookBairn enjoys stories with the big bad wolf in them at the moment. 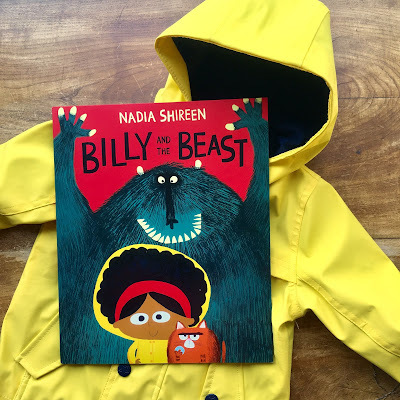 Either way, Billy and the Beast by Nadia Shireen is a story of bravery when faced with a terrible beast and set in a forest so it's a perfect autumn read. When a terrible beast starts roaming the forest in search of tiny creatures to make a big bowl of monster soup, Billy and her Fatcat cannot let him get away with it. He's got boil in a bag bunnies, spicy mice and grated hedgehog all on his list but can Billy outwit this ferocious beast and save the inhabitants of the forest? Packed full of humour, fun illustrations and a heroine who stashes doughnuts in her hair for emergencies this is a brilliant new fable that will empower as well as make you giggle. Two autumn stories rolled into one! 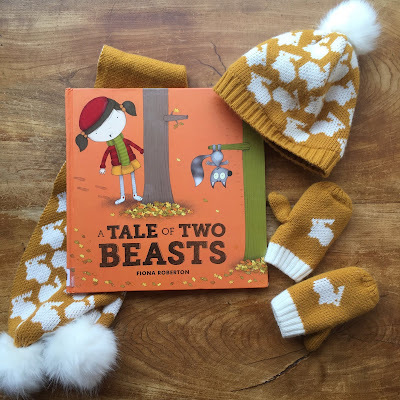 A Tale of Two Beasts by Fiona Roberton is the same story but told from two different perspectives. Firstly from the side of a little girl who finds a strange creature in the forest who she hears as squeaking sadly, so she wraps him up and takes him home, looks after him, shows him to her friends until one day he escapes out of the window. And then for the point of view of the creature who is happily swinging from the trees, squealing in delight when a little girl kidnaps him, feeds him squirrel food (he is not a squirrel) and lets her beastly friends poke and prod him, so he takes his opportunity for freedom. So who is the beast? And is there a compromise to create a happy ending? Just the cover of Not Lost by John Bond is so evocative of autumn. Mini Rabbit really really wants his mother's berry cake, but when they run out of berries, he sets off before his mother has a chance to stop him. He passes people along the way, all of whom try to warn him not to stray too far from home in search of berries (especially as in each scene there are berries hidden) but Mini Rabbit is single-mindedly hunting for berries on his own. Until he finally finds one, of course, but then he realises that he really is lost. How can he find his way home again? But wait, he can smell something... cake! He follows the scent all the way home. But with a hilarious twist (in typical toddler fashion) at the end, this one will have you laughing out loud. BookBairn just giggles and giggles at the ending! I adore the colour palette in this and I love the deceptive simplicity with which Mini Rabbit is brought to life. Cosying up with a story for autumn reading means that you need to have a comfy reading nook or chair to curl up in, right? Are You Sitting Comfortably? by Leigh Hodgkinson is a brilliant rhyming story of finding just the right spot to read. With illustrations that are packed full of great patterns and creatures and a rustic colour palette make it a lovely one to cosy up and read together. We have some lovely apple trees in our garden and BookBairn loves picking the apples of the trees and putting them in her basket. Hungry Bunny by Claudia Rueda is an interactive book where little ones have to do as the book tells them to help hungry bunny get apples. Shake the book to make them fall down. BookBairn really enjoys seeing the reactions when she turns the page to see her actions have made something happen in the story. This is a great read for little ones and has been perfect re-reading for over autumn! You could easily believe that Sweep by Louise Greig and Julia Sarda is just about sweeping up autumn leaves. But it's about so much more! The whole story, and illustration, is a wonderful metaphor for a bad mood. Ed gets swept up by his bad mood - not a storm in a teacup sort of bad mood, this is something much much worse. He can't look up and see the beauty around up. He just sweeps sweeps sweeps everything and everyone up into his bad mood. Until an autumn breeze comes along to sweep his bad mood away. The illustrations in this are visually striking and dramatic and you don't want to miss out on this one! We have already had our first autumn storm and it certainly was blowing a gale just like in this book. I'm not sure that a storm is perfect kite-flying weather in real life (don't try this at home) but, in Storm by Sam Usher, a boy and his grandad decide that it's the perfect day to fly a kite. If they can find it that is! Their search brings up wonderful memories of their days out together and the special bond that they have. And each page of the search is interspersed with the increasingly stormy weather developing outside. When they do eventually find their kite and make it outside, they have their best adventure yet. But best get home before it gets too stormy! So those are our most recent favourite reads! 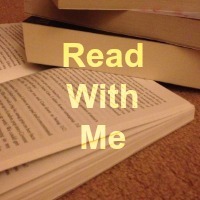 What have you been enjoying reading recently? 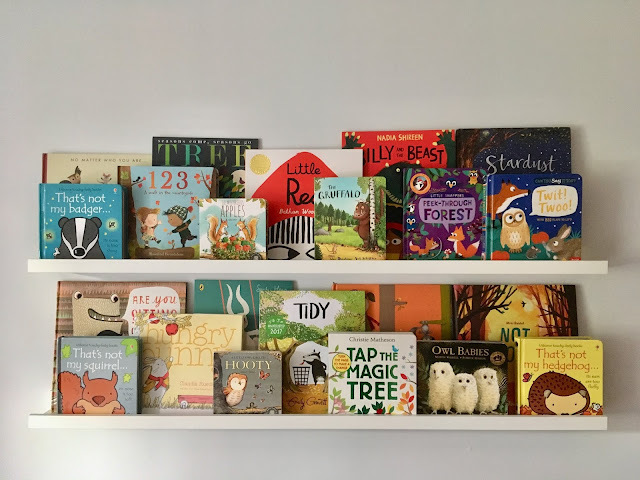 And if you can't wait to see our next quarterly installment of our Favourites Shelf, I always include a book or two in our monthly Little Loves blog posts! Disclaimer: Some of these books were borrowed from the library or ones that I was bought myself. I was sent some of these books for free for review purposes by the publishers. Words and opinions are my own. And I was not obliged to share any of them as part of this or any other blog post - selecting them for review was my choice. Please read our review policy if you want to know more. If you click on the title or image of the book you will be sent to Amazon.co.uk using an affiliate link. This means that if you choose to purchase on Amazon.co.uk, I will receive a small sum (around 20-70p per book) from amazon at no extra cost to you. I understand that you may not want to use an affiliate link, but if you like reading our blog please just think of it as a small tip for a tip-off to an awesome book. And know that your support means I can buy more books! 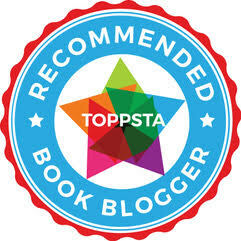 For more information check out our 'For Our Readers' section..
What a great collection of books. I’m always interested in the names of characters and love the sound of “Swankypants”. It's such a brilliant character name! And I think you must have read quite a few of these on holiday at Centre Parcs as they came with us! Thanks so much! I need to get something sorted for each of the kids rooms! It's so easy when the picture books are that beautiful! There are so many That's Not My that we are still coming across new ones! And Tidy is brilliant! Thanks Rebecca! It's my favourite time to cosy up with a book! Thank you Kate - your support means so much. And you need Sweep! What a lovely collection. When I think of autumn books, I always think of the Percy the Park Keeper books. The 'That's Not My... ' books have been around longer than you think - my son is 17 and he had one! There's clearly a lot more of them these days though. Do you know we've never read Percy the Park Keeper - and now I feel like I need to run straight out to the library! These are all so cute and creative! I have no doubt my girl would read every single one.